I’m seriously craving comfort food at the moment. Give me cheese, potatoes, creamy sauces, roast dinners and lots of red wine, and I’m happy! I guess February is one of those months where we still need to hibernate, indulge in high-calorie foods and just wait for spring to kick-start its magic. So, on that note, I’m currently only making dishes that will warm the body and the heart. My latest winter warmer: a real classic, a French onion soup. 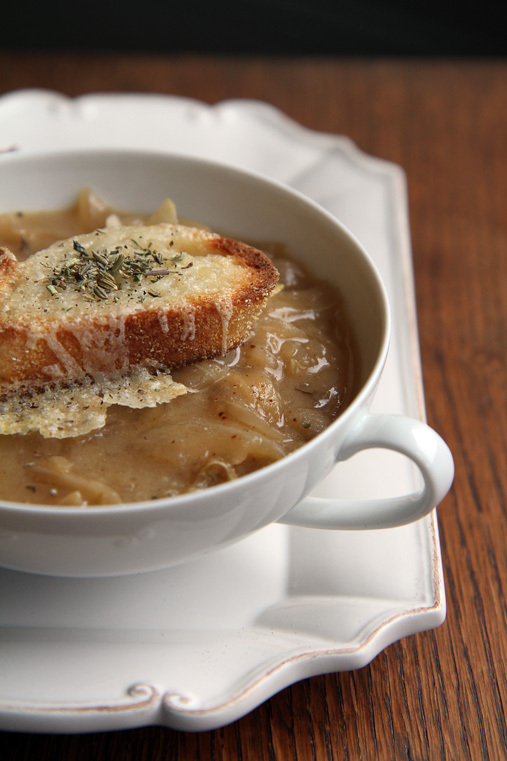 Nothing could be simpler and more satisfying than making a French onion soup. The “soupe à l’oignon” really is a poor man’s meal – but if you add lovely white wine and gruyère, it’s becoming a real luxurious comfort dish. Make sure to use a strong white wine! I made the mistake of using a cheap bottle that someone once brought to one of my parties, and it nearly ruined my soup. See, if you take a weak wine, the soup won’t develop its lovely deep wine flavour. Instead, it will stay quite one-dimensional. I ended up adding a teaspoon of white wine vinegar to the soup in the end, to tart it up and add another dimension. It worked, but still, nothing compared to using some good wine. So, one rule to remember: if you wouldn’t want to drink it, don’t cook with it either! Start by peeling and finely slicing the onions. Melt the butter in a heavy-based saucepan, add the onions, thyme and season with salt and pepper. Gently fry the onions for 25 minutes, until they’re translucent and melting. Add the sugar and flour, and fry for another couple of minutes to caramelize. Add the wine and chicken stock and cook for a further 15 minutes until the soup has slightly thickened. Once the soup is ready, heat the grill and toast a few slices of baguette under it. Turn them around and cover with gryuère cheese. Put back under the grill and toast the cheese until it’s golden. Serve the onion soup in bowls and top with a “crouton”. 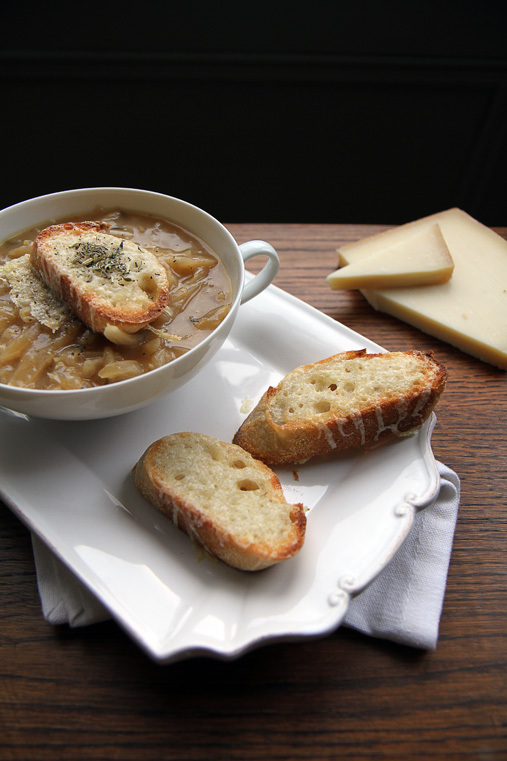 French onion soup is one of my favorite dishes! I made the same white wine mistake while making an onion jam once… never again. Still looks delicious though! Omg! This soup looks extremly delicious! Love your blog! Anne – this was absolutely delicious, I just had it for my evening meal and with winter not quite having gone away in Brussels, this is the perfect late winter warmer! I will be trying your pumpkin and coconut soup tomorrow. What a beautiful soup and such stunning photography!